Let’s have a little challenge, shall we? I challenge you to tamper ALL your negative thoughts with positivity and gratitude today, all day. You don’t have to talk about it with your friends, you don’t have to go around screaming “I LOVE LIFE!” or anything obnoxious like that…let’s just direct our attention inwards. Negativity is so incredibly debilitating yet so prominent and automatic in our daily mindset and most of us don’t even realize it’s there. I challenge you today to tune into your thoughts. Notice the positive ones but more importantly take note of the negativity, the anxiety, the past and future thinking- notice it all in its different forms. I tried this challenge yesterday, and I have to say it was more of a struggle than I thought. I always considered myself to be an extremely positive person so I was surprised to notice the negative energy that kept creepin' in whenever it got the chance. Even if it’s very brief, or over something stupid, negativity doesn’t need to be there. It shouldn’t be there. It serves no purpose. So when you try this and the negative thought or complaint comes around (and I bet you they will), let it come and go, but push it out the door with gratitude. As I’m typing this I just caught myself thinking about working out later… ughhh it wasn’t a pleasant thought. Do I have to? I’m exhausted. ...did I seriously just allow myself to feel down about working out!? I did… I noticed it, and changed my thoughts to something like this: I’m looking forward to the gym later because I’m grateful that I am physically able to, it’s a privilege that’s not given to everyone. Down about your weight or appearance? Accept it and realize you are in control. You’re steering your own wheel. Be grateful that you’re alive and still have the opportunity to change what you want to change about yourself. Every idiot driver that exists seems to be driving around me and MY ROAD RAGE IS REAL TODAY… hey guess what? My negative energy towards those people isn’t going to change the fact that they probably shouldn’t have a license. I’m thankful I HAVE a car. It’s a beautiful day. I’m safe… Relax. Growing up my dad never liked when I used the term “I can’t” or “I hate”. He would always correct me and have me soften it up to “I’m struggling with this” or “I dislike that”. I’d get annoyed when he’d interrupt my Debbie-Downer talk but little did I know he was helping me mold my thinking into a more positive state of mind. He Miyagi’d me, if you will. Learning to change your I cant’s into I cans, your hates into love and your complaints into gratitude. Once you find that your thoughts are lifting you up instead of bringing you down, you may want to continue working on this daily. 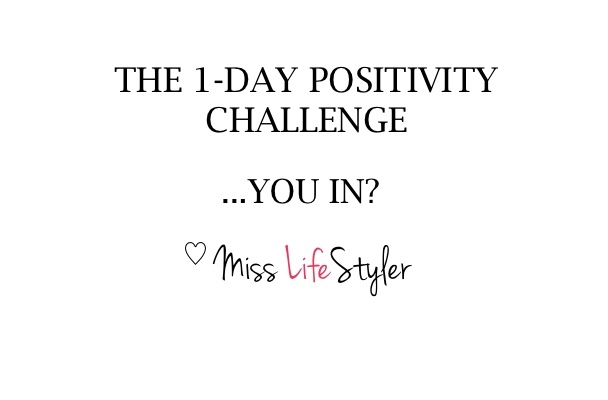 Lets start with today… You in? "Your mind is a powerful thing. When you fill it with positive thoughts and gratitude, your life will start to change"
Kimono-ver And Take A Look!